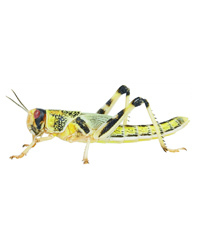 Locusts (Schistocerca gregaria) have surged in popularity over the past few years, and are a popular choice for Bearded Dragon keepers. They are both quiet, and non invasive, which has contributed to their popularity as a choice of feed. They appear to be preferred by the voracious Bearded Dragon, which has fuelled their growth as a commercial species. As with any insect, proper supplementation should be given prior to feeding to your reptile. Arrived safe and all was well.